Hey, guys. 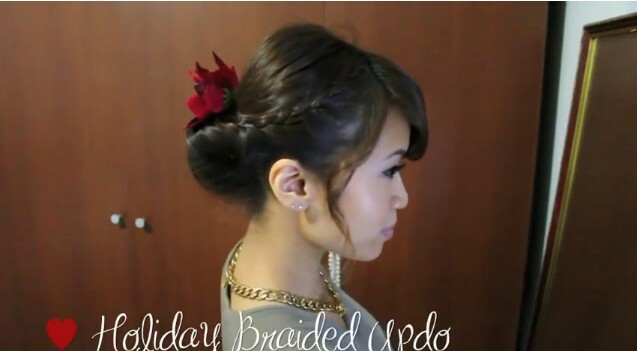 Today, I’m going to show you how to do this beautiful braided updo that’s perfect for the holidays. It looks complicated, but it’s actually quite simple. So if you want to learn how to do it, then keep on watching. Start off by brushing your hair and smoothing everything out. This part is optional, but if you want to, you can leave some strands hanging out. Clip it to the other side to keep it out of the way. 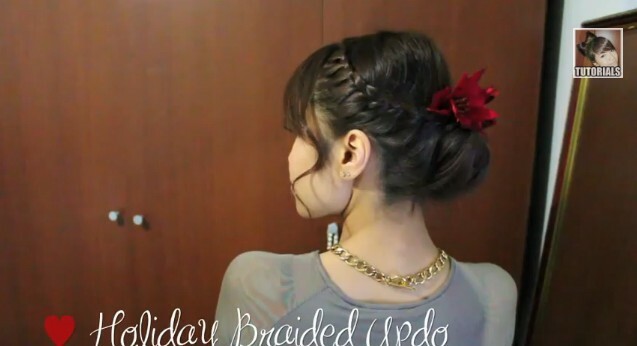 You want to start your braid at the top of your head– where your part is, and divide it into three sections. Now, you’re going to do half a French braid. So take the strand on the right and place it over the middle. Then take the strand on the left and place it over the middle. And this part gets a little bit tricky. Pick up some hair in the front of your face and incorporated with the right strand and place it over the middle. Then with the left strand you’re not going to pick up any hair. You’re just going to cross it over the middle. And if this is a little bit too complicated for you, then here’s another video explaining it pretty thoroughly. So if you want to, you can click on the thumbnail and watch it first. You want to continue braiding your hair like this until you reach the back of your ears. And after you reach your ear, you just want to continue braiding without picking up any hair. After you have finish braiding, take an elastic band and tie it off. Then you want to do the exact same thing to the other side of your hair. So part your hair. Clip it and braid it. When that’s done, combine the braids at the back of your head and tie it with an elastic band. At this point you should have a crown-braid headband. Now, you want to grab a thicker hair band and tie up all your hair. If you have long hair like I do, what you want to do is loop up your hair. Just like so– and then twist the hair tie and loop up another section. This will make the next step a lot easier to do. If you have medium length hair, then you’ll need to loop it once. Now, you want to create a hole at the top of your head– right in between the braids. And then you want to tuck your hair right inside that hole. Now, if you didn’t create a bun before tucking your hair in, what’s going to happen is your ponytail is just going to stick right back out. And you are going to end up with a looped hairstyle. It’s a cute hairstyle that I’ve done in the past, but that’s not the look we’re are going for today. I personally think this hairstyle works best on medium length hair, and because I have a lot of hair, as you can see, the bump at the back is really big. This part is optional but I’m going to grab my KQC flat iron and curl the front of my hair that I left out earlier. I always like having a few loose strands for updos. If you want to, you can accessorize with some flower clips. And I think this hairdo is perfect for the Spring or Summer. And it’s perfect to wear to a wedding as well. If you want to make it more festive, just grab different types of flowers that’s appropriate for the holidays– and stick it right in the center of the bun. So here’s the completed hairstyle that you can sport to any event. I hope you like it, and thanks so much for watching. Bye.